Don and I have been lucky so far this year, having gone 2 for 2 with both KMX (my first time there) and then Dillingham with Alex, both flights lasting as long as we desired with some small XC thrown in for good measure. We both took yesterday off to do some work, and missed out on the first flights at Kahana, which sounded like a lot of fun. Speaking of Kahana (shameless plug here), I'm actually selling my beloved condo in Makaua Village. So, if you're a pilot and want to live in the lift band across the bay from Kahana, hit me up! Don and I got a later start to the flying day at Makapuu than we'd planned on, finding Shawn packing up in the LZ. Turned out he'd landed because he was cold and wanted to grab a jacket. "Easy up from Juice", he said, and "Jorge blasted downrange already". We loaded him in and made the short drive to Juice. "I'd drive right to launch if I could!" joked Don. He would. Just then Reaper zoomed by in his truck and gave a wave and then Third-Time's-the-Charm, newly-wedded Dave was dropped off by his lovely bride Kim, and joined us on the short hike. Shawn went first but the wind had swung more east than on his previous flight, and he was flushed pretty quickly, putting down across from the bathrooms near the beach. Almost thought he was going to do a touch-and-go on the roof. "When it's this east, the challenge will be getting up", said Dave. "But once you make the jump to Puu O Kona, it should be easy going". He launched next and made it look easy, climbing up right off launch. I went next and had to reach deep into my bucket of scratching-skills to pull it off, and bit-by-bit worked my way up the spine before the Cactus bowl. No fun at the time. I then worked the more east facing sections along the ridge, climbing to a max of 1,600 feet over Ironwoods, when I saw Dave beelining it to Puu O Kona, arriving a couple hundred feet below its crest. Hmmmmm. Do I wait for Don or do I use my height and try and follow Dave? I elected to wait for my buddy, not knowing that 1,600 feet would be out of reach for some time to come. I watched from above as Don made a few launch attempts in the swirly and more east-flowing winds on Juice. Shawn had hiked up for another go, and was joined by Kaaawa Larry and another pilot by this time, and Don finally got airborne. If it was possible, he got even lower than I did, before squeaking it out and getting up and out. Nice job buddy! And then we wished we'd launched an hour or two earlier. Try as we might, there was nothing to be had from Ironwoods to Three Poles that would give us more than 1,500 feet, and our hopes of following in Jorge and/or Dave's wake seemed dashed. Or were they? Just when we were about to call it a day (we saw Shawn bomb again, poor albeit fit guy), we got a snarly, leeside thermal near the hang launch and hung on as best we could until it spat us out near 2,000 feet! My radio battery was dead, so we couldn't communicate directly, but we both knew it was now or never as we banked left and shot out over Ironwoods towards Puu O Kona. Having watched Dave work his way up from there, I knew there was lift, but I have to admit that our arrival height was a bit disconcerting. I was actively eyeing bomb-outs and trying to figure out if I'd be able to clear the two sets of ginormous powerlines en route. Don appeared to have found a little something worth turning in and I quickly joined him. This was the second crux of the flight. One more was to come many miles away. Once we established ourselves over Puu O Kona, we passed the 3,000 foot mark and could breathe easy. Cloud base was a few hundred feet higher, so no visibility issues, which was nice. Due to the east wind, from there it was smooth sailing over the Pali, Likelike, Stairway and the H3. We actually never got much lower than 2,400 feet, and would just top back up close to 3,000 feet before making the next transition to more into-wind faces. Further downrange, we left for Waiahole at about the 3,000 foot mark, both of us pretty content to call it a day, but our glide turned out to be super buoyant so we pushed on towards the spine that protrudes towards the ocean from the Pyramid, and decided to take the shadowed, but more into-wind side. Well, Don picked that side. I hung back with a bit more height and rode the spine while waiting to see what, if anything, he'd get (it was hard not to fly to the side with some sun still on it). There was next to no movement in the trees, but Don seemed to know where he was going, and I reluctantly followed. We were pretty low in there when Don found a couple beeps to turn in, and I pimped off him and, with my extra 50 feet or so, I managed to pull some tight S-turns, and a short time later found myself climbing up over the very peak of the Pyramid, popping back into the setting sunlight. This was a special moment for me, as I've never flown over it before. Thanks Don! And good job sticking with the light lift you found and getting up and out of there! At this point, I was at about 2,400 feet, and was faced with a choice: do I tuck into Kaaawa Valley and go left? Or do I push out to the right and try my luck along the front of Kualoa? I swung back over to Don and yelled down, "Left or right?!" He pointed right. And boy was he ever. Or, I should say, Dave was! As it turned out, Dave made the decision an hour or so earlier to go left into the valley and got flushed, which he kindly relayed to Don on the radio. Mahalo Dave! I flew across the steep-faced Kualoa ridge wondering how or if it would work at the back section as it wasn't very square into wind. (the boats I could see in the far distance were helpful with this.) Wondering if I would get any rotor from the larger, front section due to my angle, I decided to just go for it and ran smack into the biggest, sweetest thermal of the entire flight. I think there was some leeside component to it, as the other side of the ridge was still in some sun, but regardless, I banked hard and cored this baby up to 3,300 feet or so, before letting myself go with the wind, drifting smoothly across Kaaawa Valley, past Bobo's, and my condo. (It's a move-in ready, second floor jobber with a full-size washer/dryer, and a loft, by the way.) And then I flew over to Kahana. Pure and utter sweetness. It was getting pretty late in the day at this point. I'd been in the air almost 3 hours, which is rare for me as I'm not one for flights this long anymore, unless there is distance involved. Don was still playing in the sweet Kualoa thermal, probably getting even higher than I did, as I crossed the bay. First time I've even flown over Kahana without having launched from it. Definitely an experience I recommend. Only thing was, it didn't feel like Kahana. It felt trashy as heck and I couldn't see any movement at all in the trees below. Can you say east? Don then arrived and headed straight for Puu Piei and it didn't take long for us both to realize that our flying trip was coming to an end. We turned and pointed our gliders to Punaluu and arrived there easily. Next time we'll get to launch earlier and catch Jorge at Kahuku. Thanks for the story Jayson. We know we'll never get one from Don so as his professional sidekick you are definitely the next best thing. Glad it was worth your time today despite the small distance. If Don uploads his track I will staple it to the story. First, Thanks for the write up, this was one of the best reads in a while. Alex was right on one thing, Don won't write it, hell someone might have to read it to him. Alex was wrong or being sarcastic on,'despite the small distance.' log those flights cause you know Jorge won't and your names will be top of 2015 Hawaii League for awhile. I loved the real estate plugs almost think this should be in a paraglider pad search or something. Don is the lucky dog. He has had some super low saves lately and I think that is just egging him on to go further cause he knows he'll just find away up. That ain't luck, he's just good, stubborn and hates to loose. Your write up almost doesn't need a track log, I could picture it all the way. Maybe next time I can be a 'SideKick' to Hawaii's Top Duo. Was that Don's Longest flight here? I want to be there when we skip over that ratty golf course and end or fly over the Turtle Bay Resort. If your gonna Dream, Dream Big!! Awesome flight, again thanks for the story even with out JJJ bitching, makes living with him a little easier. Just ribbing him because he writes that he doesn't like to fly long unless there's distance involved. I know 24 miles probably isn't much for him but we're happy to share some of the best conditions our little island has to offer! Haha! I read it as such Alex. And don't get me wrong - it was a wonderful flight and the views at the end with the low light were crazy cool. I just don't have the stamina of you young bucks. What a sec, aren't you WAY older than me? Jorge and I were texting midday, his last text was 'awesome conditions'. I knew it was on. I love light easterly conditions at MPU, because the early stretch can be difficult, the wrap of the Koolau make easy going as you head north. Jorge was already passing kahana when I was launching, and Jayson and Don were getting a slow start. The lift was light but the sink was minimal, I pretty much ridge soared the east faces on the way. 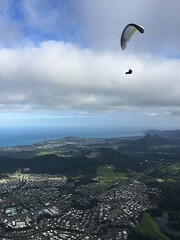 At the Pali I soared up the SE face to 3800', I did it again at Haiku Stairs, I bet I even stayed clear of the Class D.
Afterward I just cruised at 3000' feet to Waihole, I contemplated Boogas, but with the lift so light I was concerned about getting low back there. Jorge radioed that Kaaawa Valley was good so I headed that way. I got into the back of the valley at 3000' and got some wobbles, then my glider felt mushy for a long time, there was a very unlikely strong valley wind from the north and I was caught in the tractor beam. I landed to the mild interest of 100 cows. I ended up catching the bus to Ala Moana and got a ride home. I did relay the info to Don about Kaaawa, Jayson and Don showed me it was a winner in the super east. Good flying, let's do it again. I launched about 1/2 hour after you guys and was trying to get over to you when you went up and out. I never got above 1600' the whole time I was up so it looked like you caught the last train out. Sure would have liked to have tagged along. Ka'aawa Larry - you did well to get up at all buddy. Nice work!